ALPHA - Adds keys A-I to the vandal resistant digital panel ..
Boxed timed extension strobe unit for use with all Videx door entry systems. Timed period is 2- 60 s..
Extension apartment strobe for the hard of hearing. 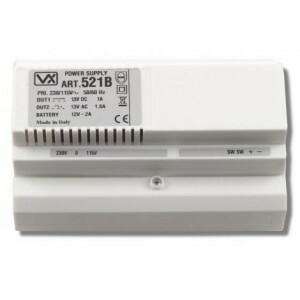 A local power supply such as the Art521 will be .. Flush mount stainless steel crescent key firemans switch. [DIMENSIONS: face plate 100mm x 100mm, bac.. Flush mount drop key fireman switch constructed from stainless steel with a bezelled back box. ..
12V 7Amp hour battery [DIMENSIONS: 150mm(W) x 65mm(D) x 95mm(H)] ..
IP55 rated lockable metal cabinet with removable mounting plate [DIMENSIONS: 400mm(W) x 500mm(H) x 1..
IP65 rated lockable metal cabinet with removable mounting plate [DIMENSIONS: 500mm(W) x 600mm(H) x 1..